No fewer than three planes flew us from Cape Town to Kahana, a dirt airstrip roughly 45 minutes by air from Maun. 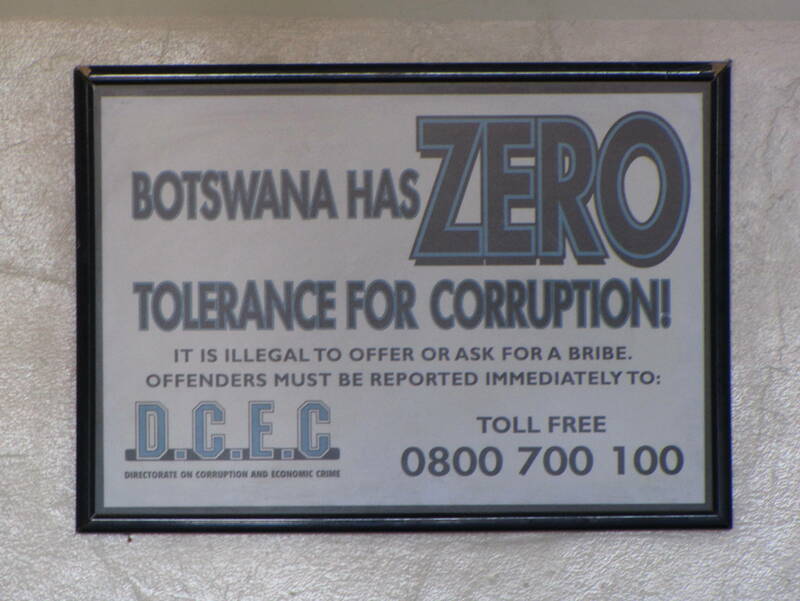 It was at Maun airport, a dusty backwater where no one should have to spend more time than is absolutely necessary, that the government of Botswana let us know that bribery and graft would not be tolerated. 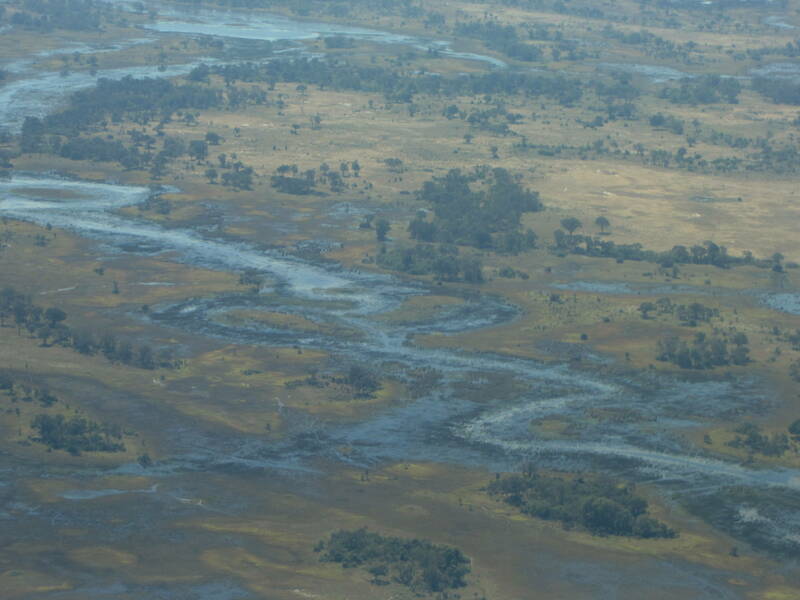 We flew by Cessna to our docking point, and our jaws dropped en route when we gazed at the Delta below. 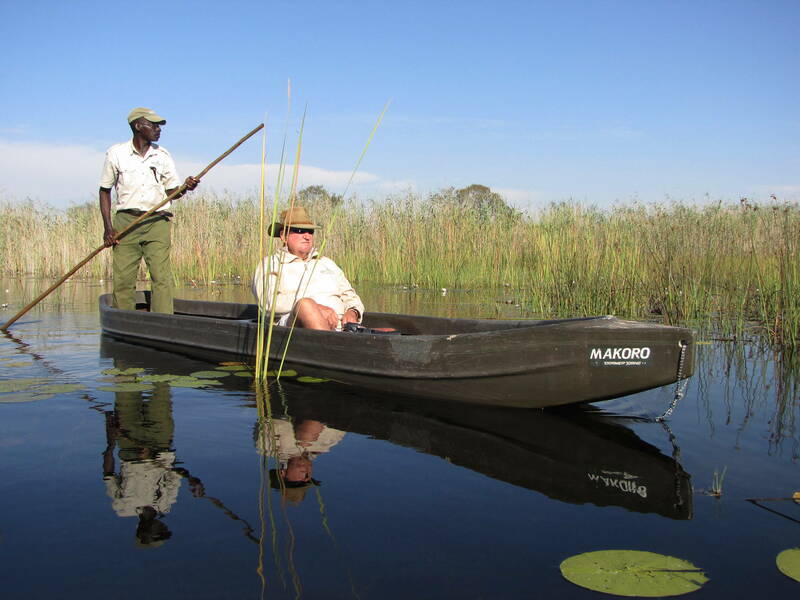 Hippos and crocodiles owned these waters, while elephants owned the land. We landed, a bit queasy but otherwise no worse for wear, and hadn’t even left the staging area when we heard a noise from the nearby tall grass. 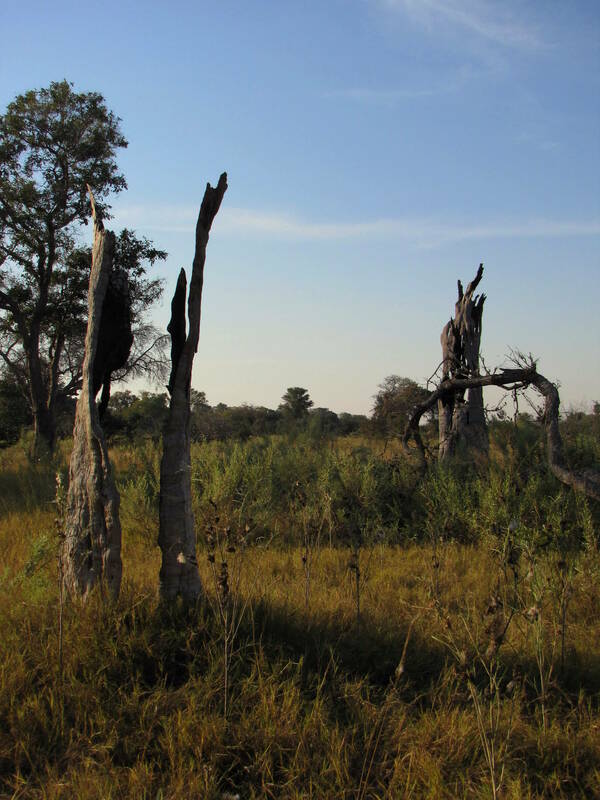 I climbed a termite mound that was taller than me to get a view. 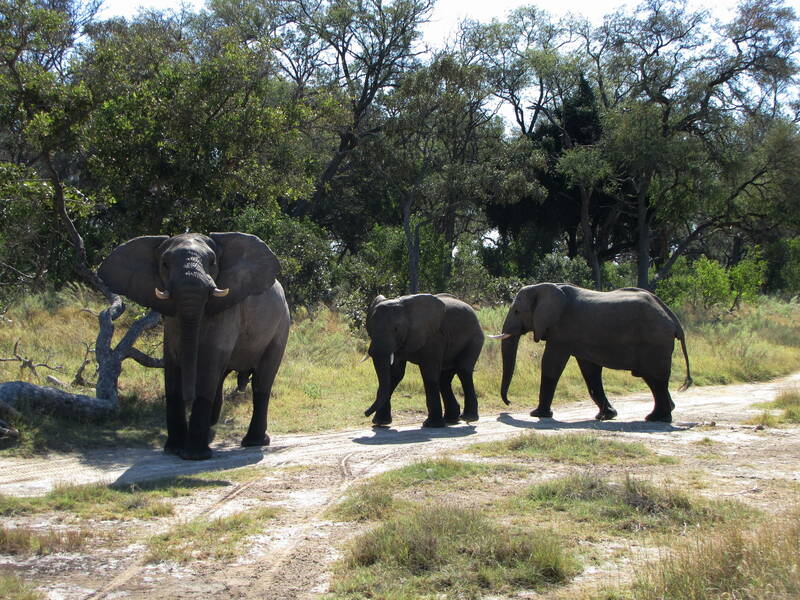 Pachyderm! Do not. I repeat – do not – make elephants mad. We survived our elephant encounter and met up with our guide, Dougie. He bore a British accent but had lived in the area for 50 years and knew these waters like the back of his hand. The water couldn’t be clearer and the weather couldn’t have been any nicer. 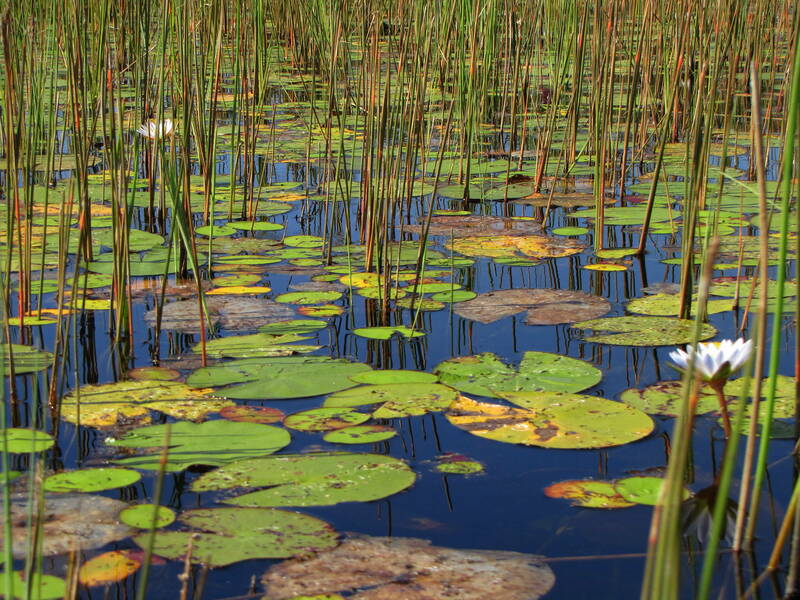 Navigation through the Delta was often via “hippo highway,” open canals formed by hippos blazing a trail through the reeds and lilypads. 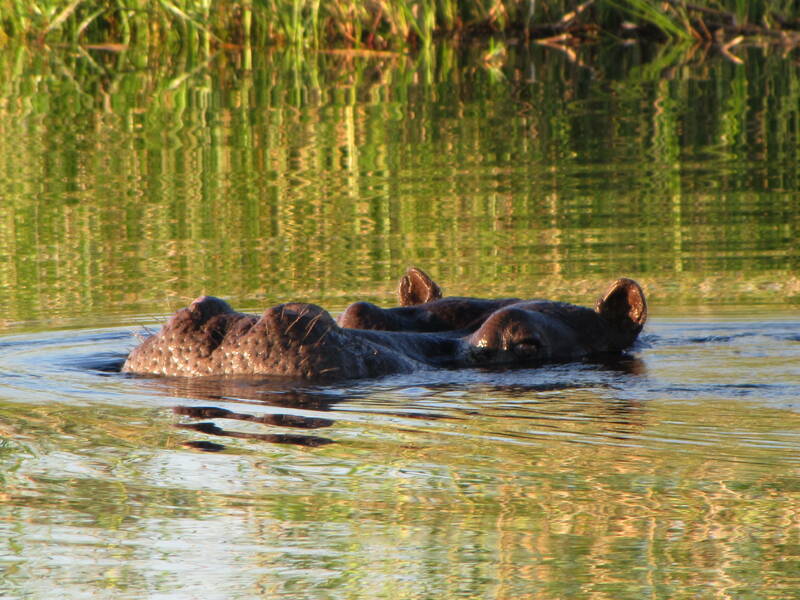 Hippos kill more people in Africa than any other animal. So if you see one in the wild from this proximity, you are TOO CLOSE. 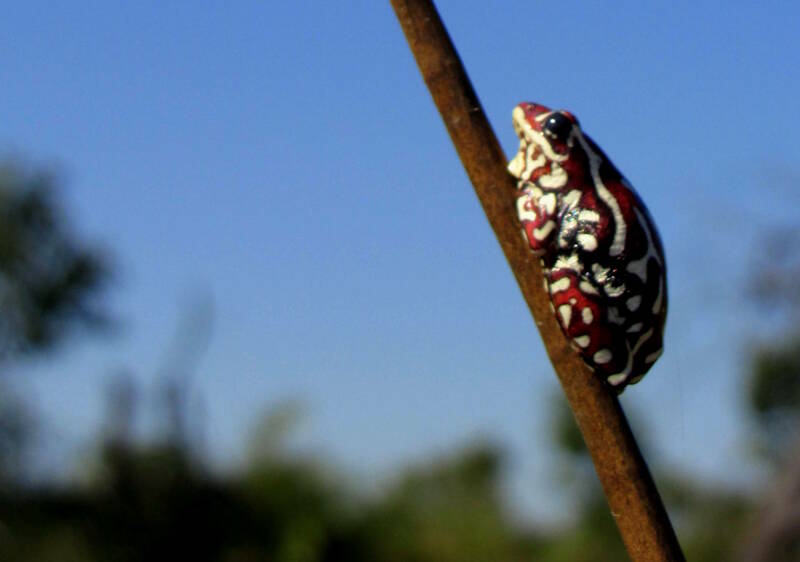 …but their croak sounds like a xylophone and is loud enough to wake the dead. 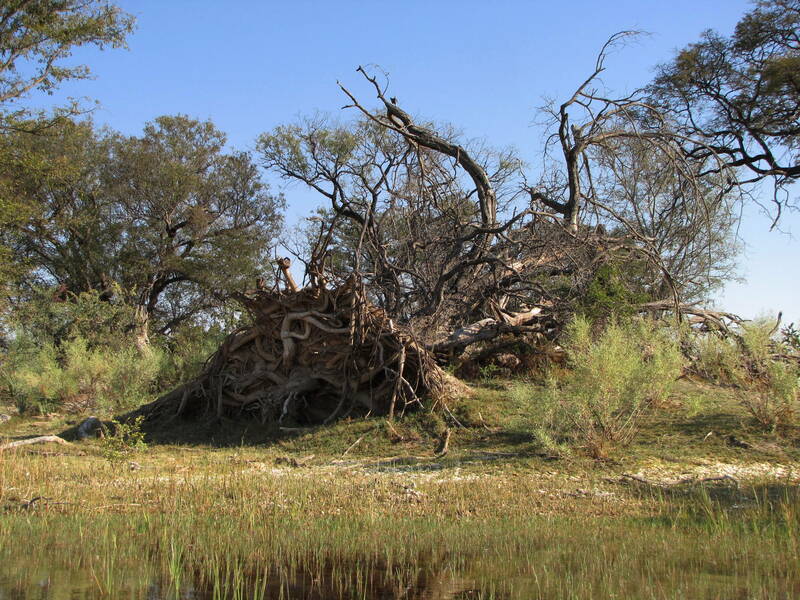 The Okavango Delta forms each spring from Kalahari Desert floodwaters. 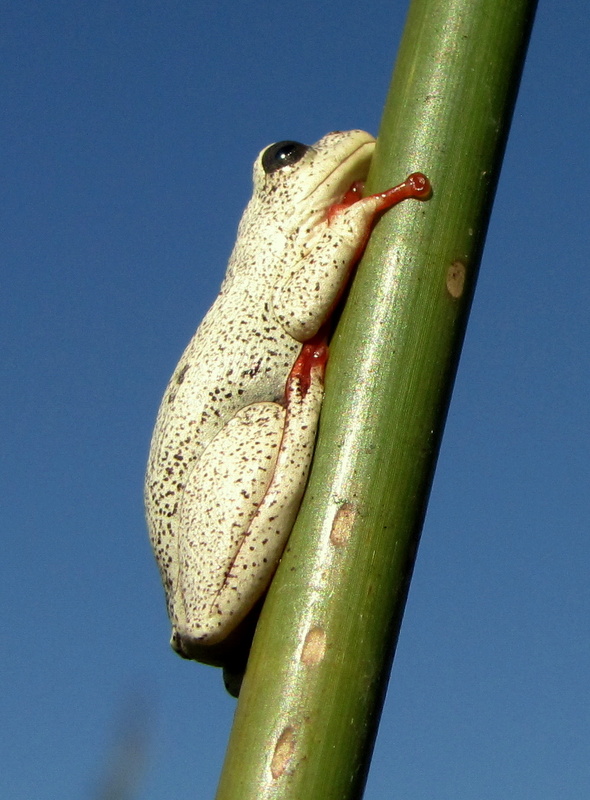 The “high” land that doesn’t become submerged becomes a refuge for land-based mammals and brave (foolhardy?) tourists. Our accommodation for the next two nights: our own private island! 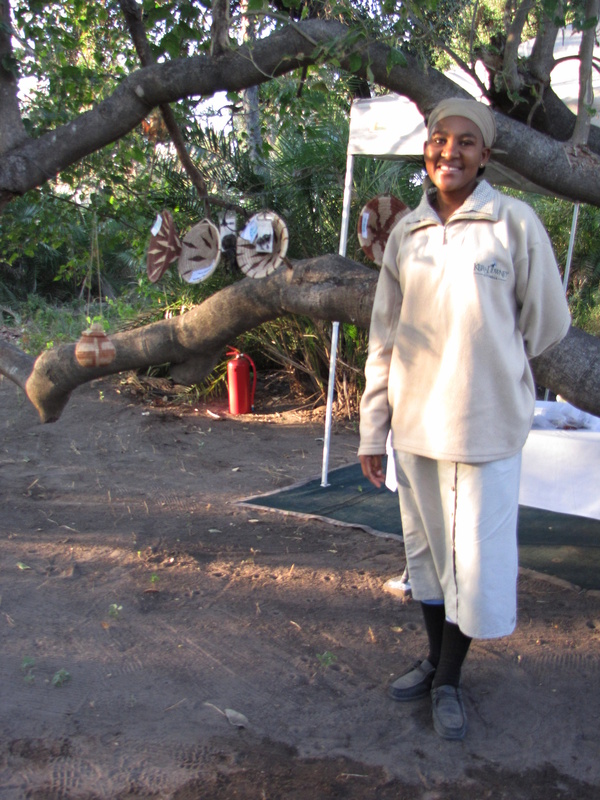 The hostess, above, greeted us and showed off her handicrafts. In addition to our guide, our hostess, and our gondoliers, we also had our own maid, a private cook, and the well-stocked “minibar” above. 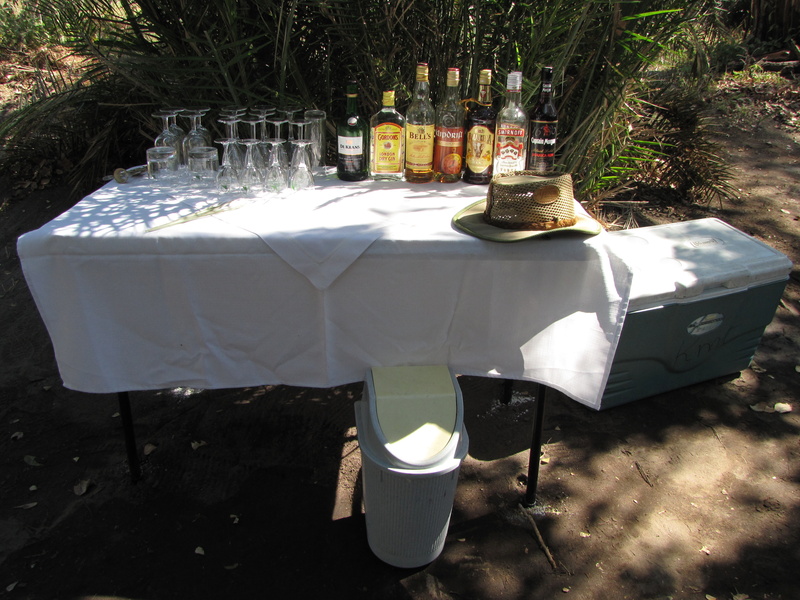 Each night, we fell asleep to a xylophone concert – er, frog serenade, rather – while hippos grunted somewhere not-so-far away. I no doubt dreamt of snakes and crocs invading the island. Our guide told us an amusing story about newlyweds who honeymooned here and requested the tent’s canvas roof to be rolled back so they could sleep beneath the stars. 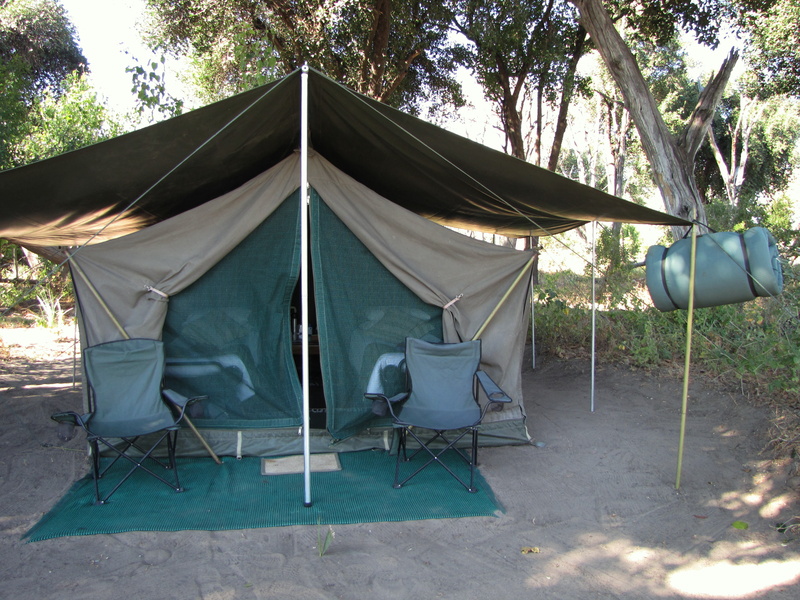 They heard a noise and woke up to see an elephant peeking its head over the side of their tent! 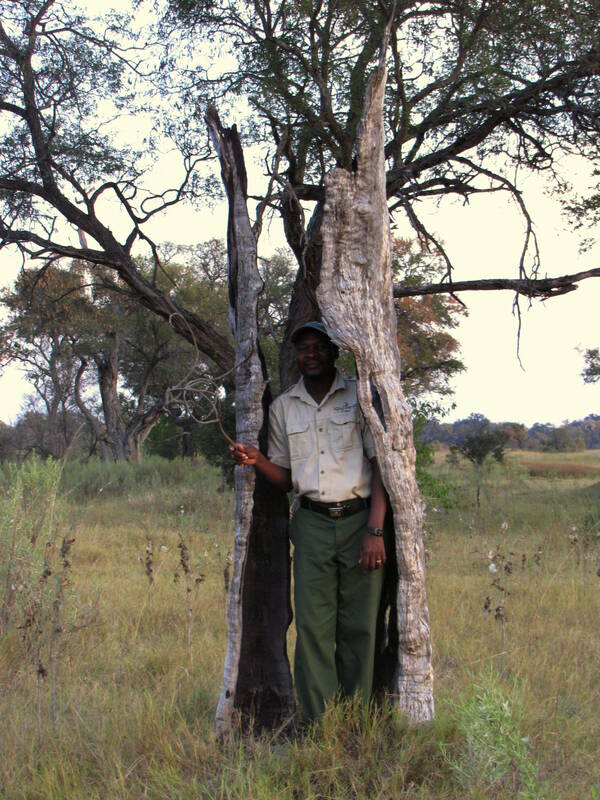 Speaking of elephants, we alit at several islands the following day, and were told that this tree was likely felled by an elephant, possibly during a mating ritual. 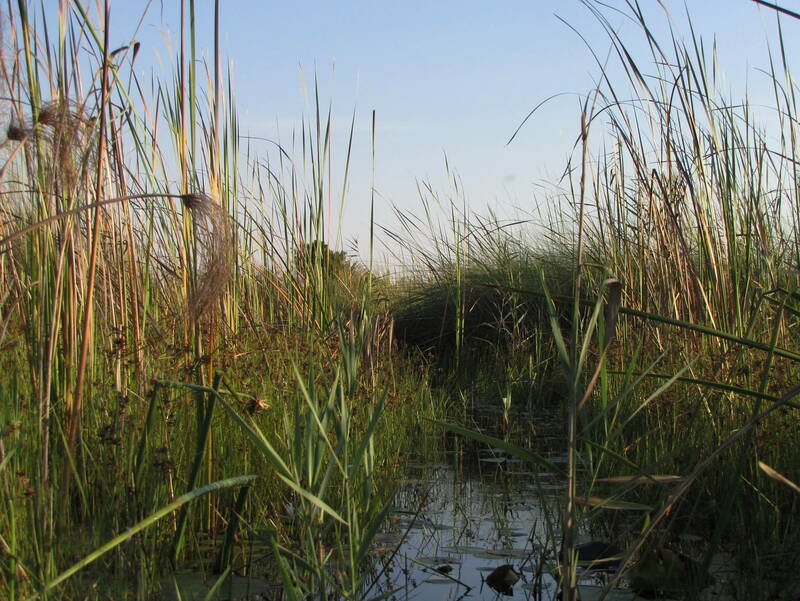 The Delta’s islands were a veritable paradise for birders. 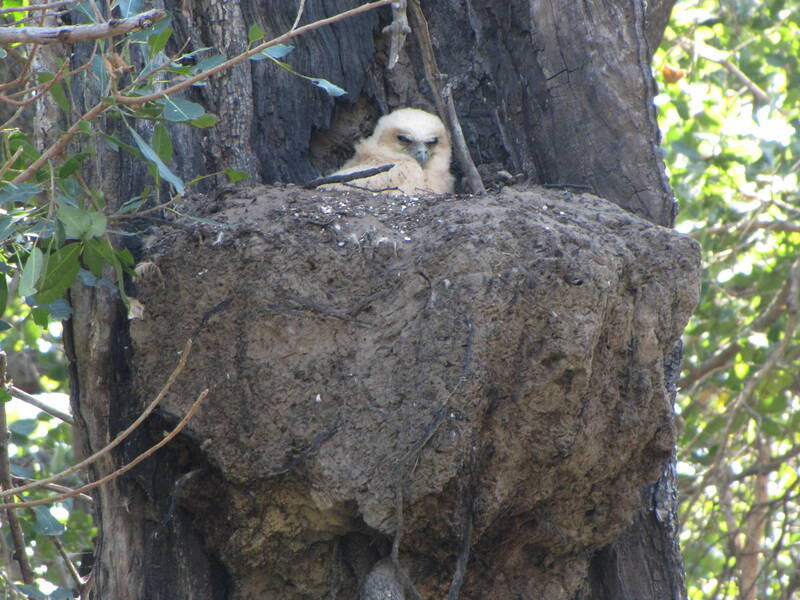 The avian high point of the trip was probably spotting this baby Pel’s fishing owl. Guide Dougie claimed that this was his first time seeing a baby owl. 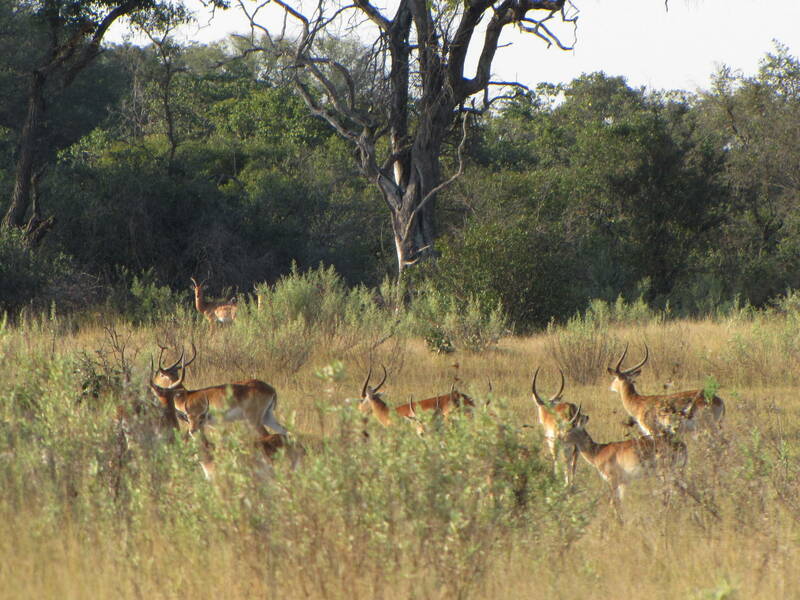 We saw several small herds of gazelle and impala. 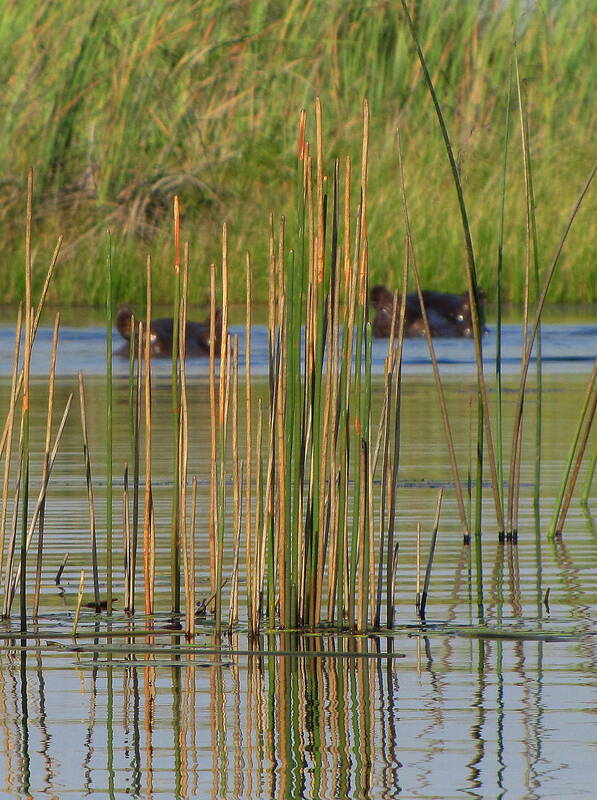 I also spotted in the reeds – for the briefest of moments – the elusive sitatunga, a horned antelope, even smaller than an impala. I rose from my seat in the makoro for a better view, lost my balance and almost fell into the water. The splashy commotion sent the flighty mammal on his way. 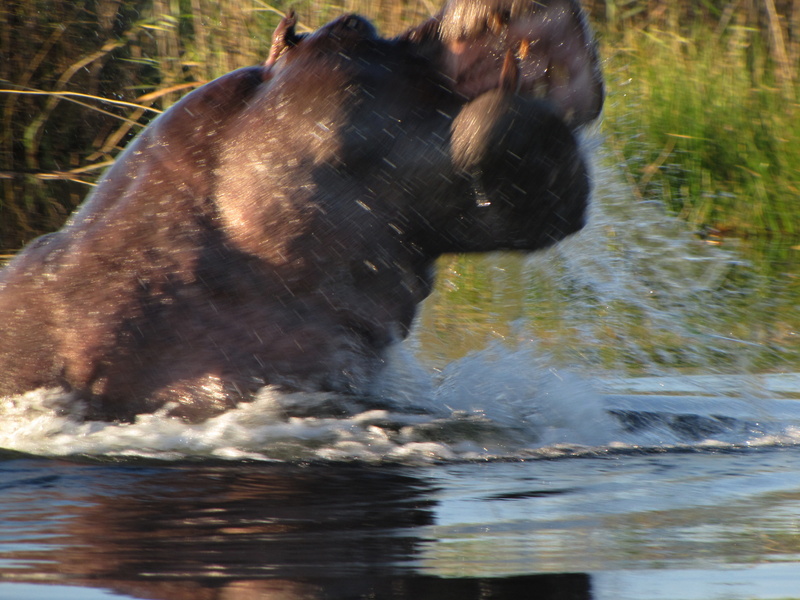 Speaking of splashes: Henry and Hermione Hippo! 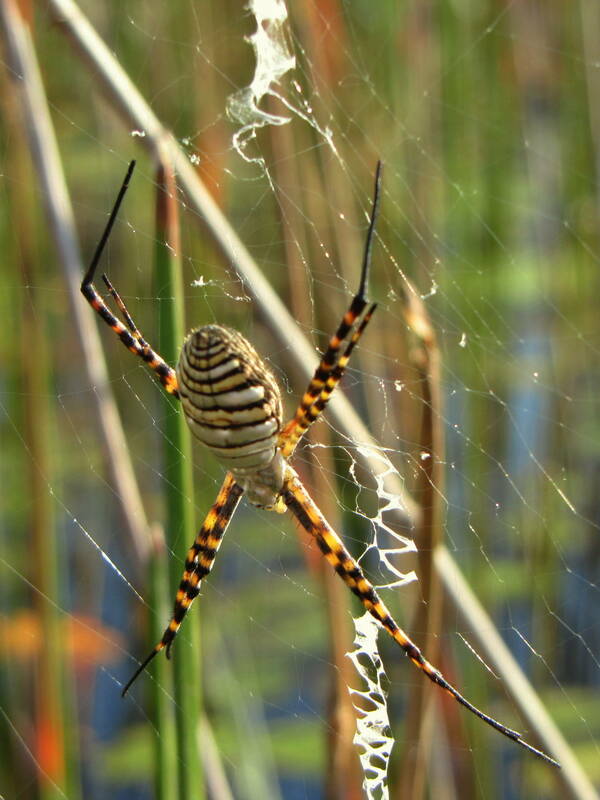 And spiders. Lots and lots of spiders. Islands such as this one, scarred by fire so many years ago, have an eerie sort of beauty to them. 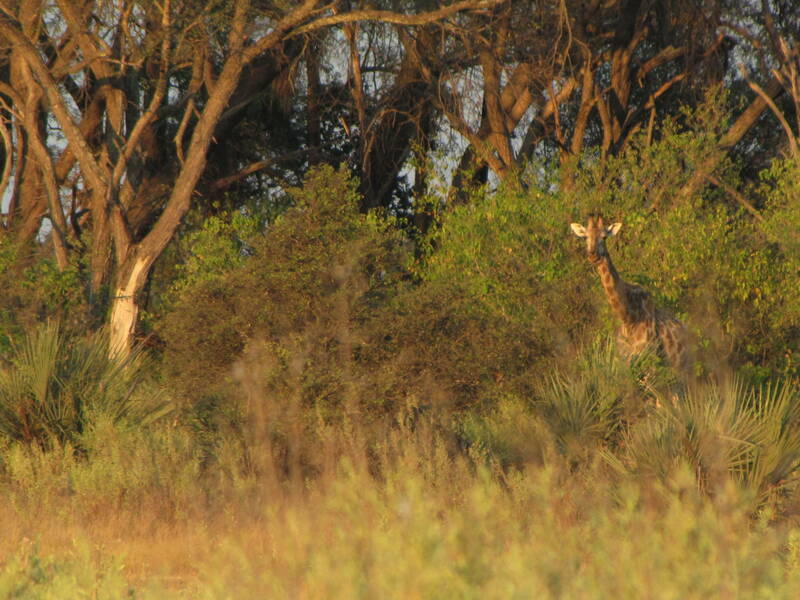 Can you spot the giraffe in the picture above? 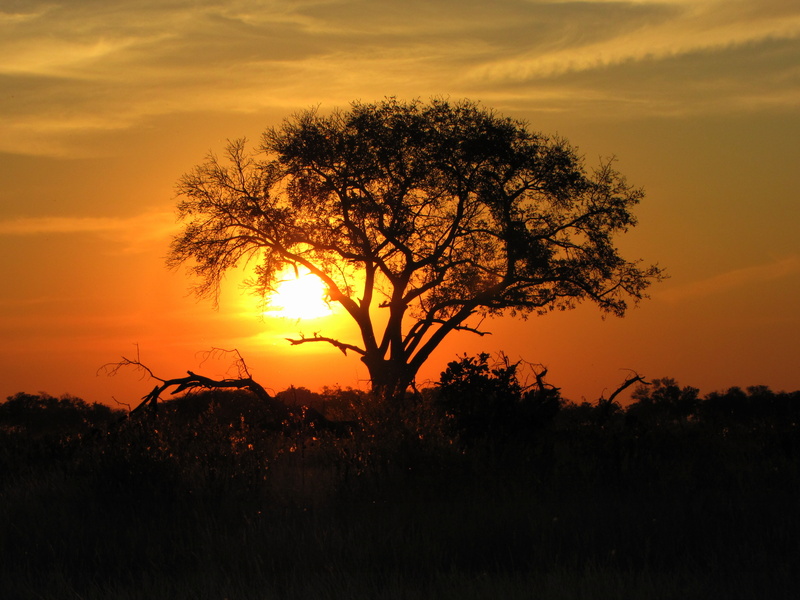 As sunsets go, there is no place on Earth like Africa. 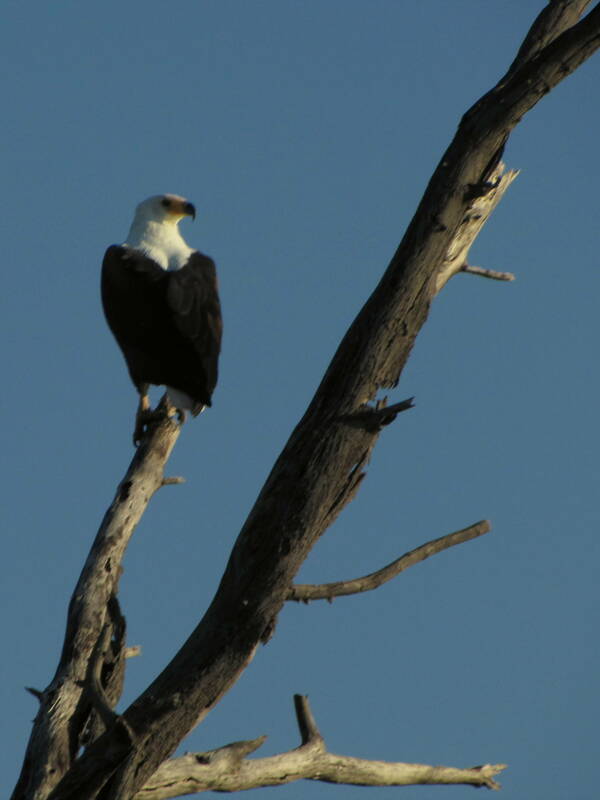 Our final morning on the Delta featured more bird watching. The image above seems more at home on, say, a Yellowstone calendar, but it was actually taken two hemispheres away! 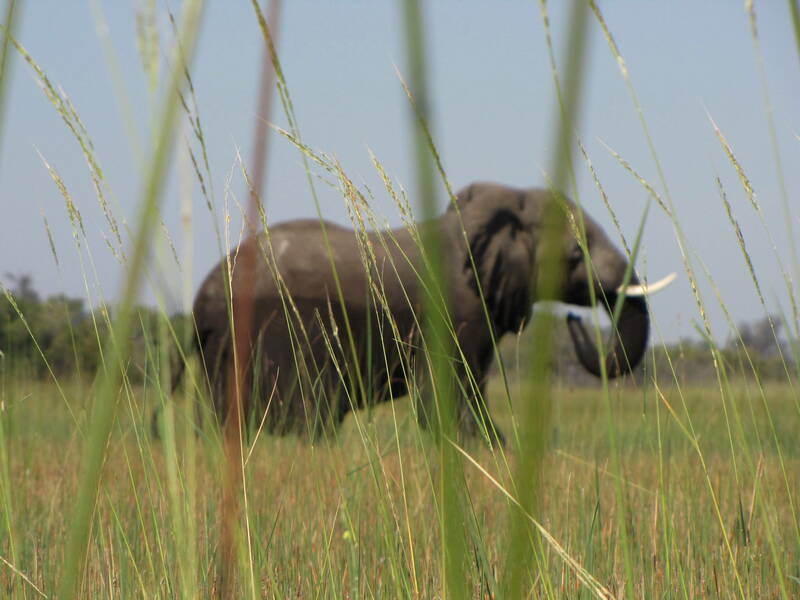 One last elephant encounter. 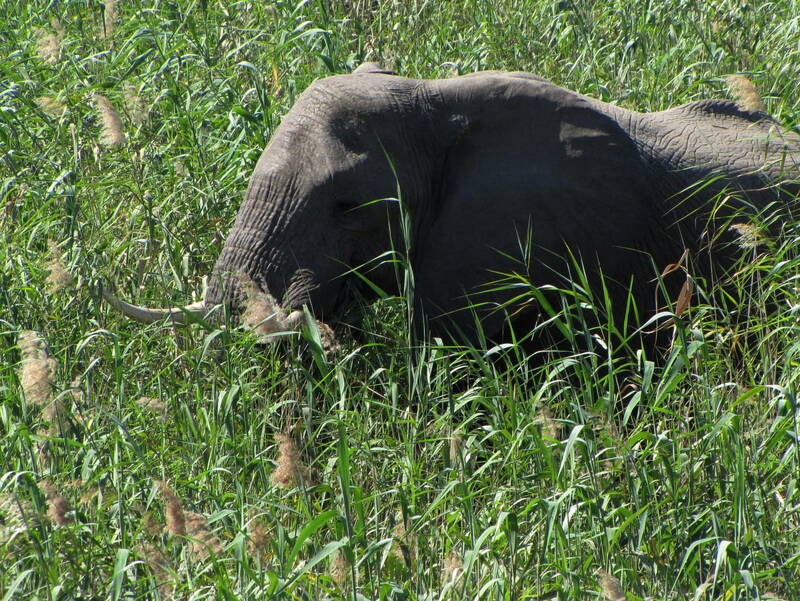 Note to ivory merchants everywhere: leave these amazing creatures alone. 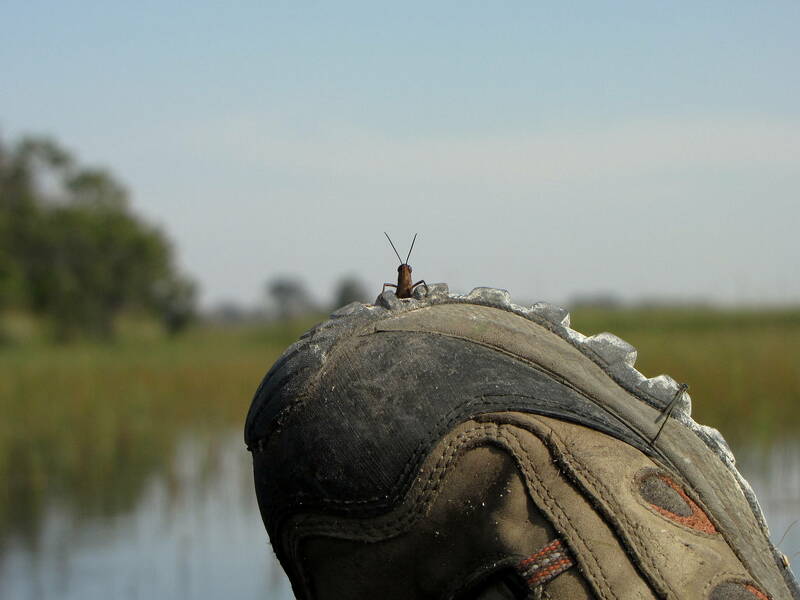 Stowaway on my shoe, telling me in his best “Jiminy Cricket” voice not to leave. My driver, both humble and wise, made me a floral lei for the journey home. 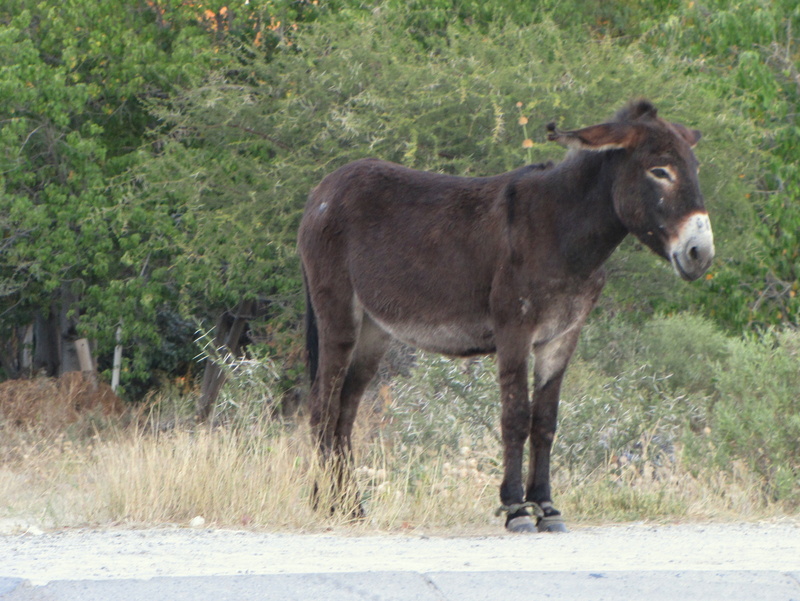 Back in Maun, we walked around the town and happened upon this donkey, waiting at the bus stop. I hope she had exact change! 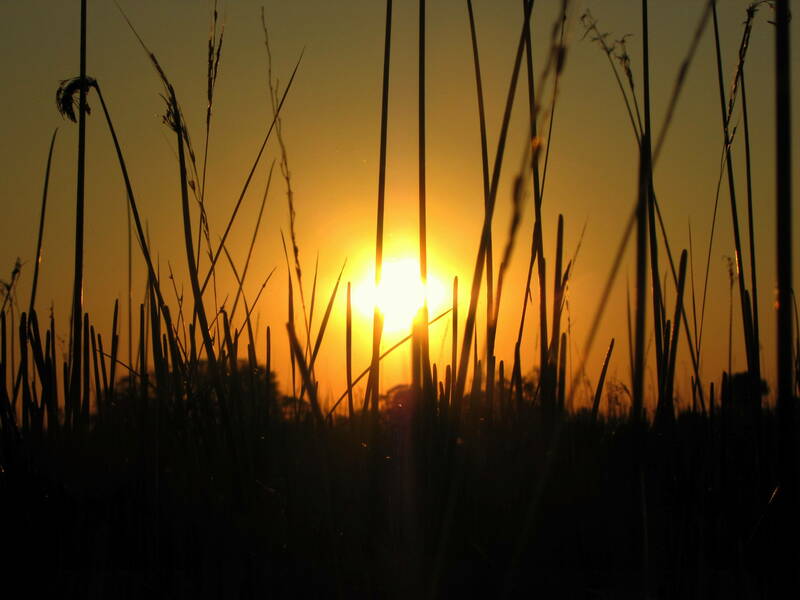 I will never forget my time in Botswana and in the Okavango Delta – a miracle of nature and an oasis of life. 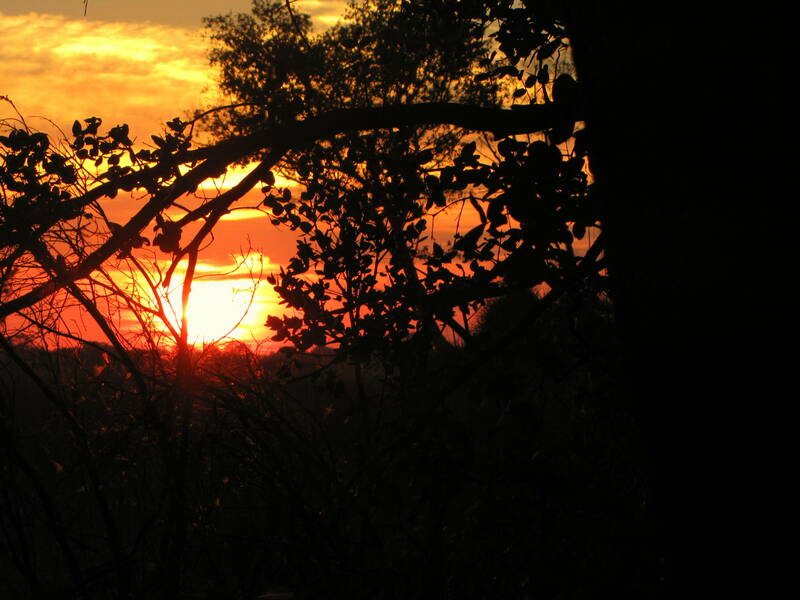 All pictures were taken with a Canon Powershot camera. All images are the property of GringoPotpourri unless indicated otherwise, and should be used with permission only. Thanks. The whole experience was surreal; I still can’t believe I was there.